The Blackhawk is 4.5 MB. Larger files take longer to load. 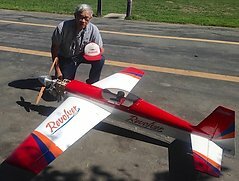 as an "Old Timer" model eligible to fly in SAM (Society of Antique Model) events. 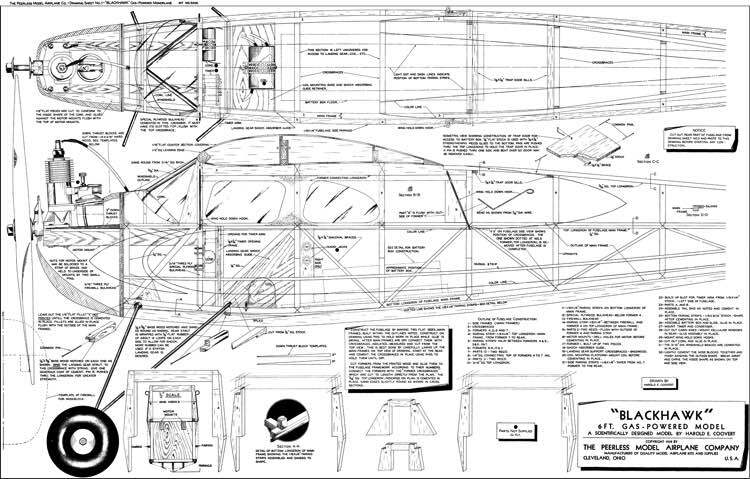 Spanning 72 inches, the Blackhawk initially appears to be an ordinary cabin model but upon closer examination of the exquisite plans - drawn by Coovert - the following subtleties appear: slight sweep in the main wing panels, twin rudders, and slight dihedral in the horizontal stabilizer. If built and flown today as a large and light sportster, worthwhile modifications would include rudder and elevator radio control, and powered by either a 4-stroke glow engine or electric propulsion. If you need to resize a plan please contact us with the ID:79830 and the desired wingspan. I will calculate a price upon request, please contact me here mentioning this PlanID: 79830 and the job you wish me to do. This plan is 4.5 MB and was shared by our member aeroastro on 25/03/2015 15:16 in the PDF Bitmap Wood Model Airplane Plans (1) category.